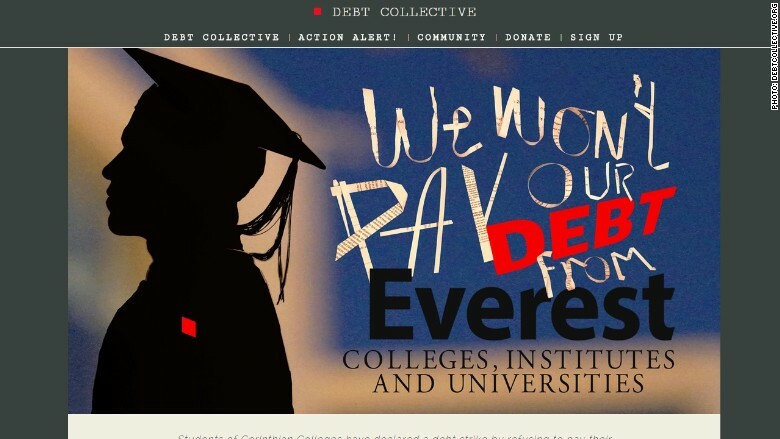 Some former Corinthian students went on a "debt strike" earlier this year, refusing to pay off their loans. Another 85,000 former Corinthian students will be able to use a fast-track process to get their federal loans wiped away. A new investigation shows that the defunct for-profit college lured students with inflated job placement numbers at more of its campuses than previously thought. "The results of our joint investigation will allow us to get relief to more students, more efficiently," said Education Secretary Arne Duncan in a statement. His office worked with California Attorney General Kamala Harris to prove that these students were wronged by college campuses that misled them on the benefits of a degree from one of its programs, including their possible job prospects. In one of the worst cases, a Wyotech campus in Long Beach told students in 2011 that 100% of its graduates found jobs. But according to the Department of Education, 0% found a job in the field of their degree. Corinthian College owned brick-and-mortar campuses across the country as well as online programs. Only some students are eligible for a streamlined process set up by the Department of Education. Before today, that included anyone who was enrolled at one of the 30 schools that closed last April, because they were shut down suddenly when the school filed for bankruptcy. It also included those who attended a Heald College between 2010 and 2014, because the government previously found that those campuses also misled students with inflated job placement rates. The additional former students who are now eligible attended Wyotech and Everest schools in California or enrolled in Everest's online programs. In many cases, "students were left unemployed and saddled with a mountain of debt" after finishing their degree, said Attorney General Harris. If you think you're eligible for loan relief, you must file a claim with the Department of Education. It won't come automatically. Since June, about 10,300 former students have filed a fast-track claim and 5,400 have been approved, amounting to $70 million in loan relief. Students who are not eligible for the streamlined process can still apply to get their debt canceled by filing what's called a "borrower defense claim." In that case, the student will have to prove that they were wronged by the school. Find out more about how to file a claim to get your debt canceled here. Did you take out loans to go to a Corinthian College?Share your story with CNN Money and you could be included in an upcoming story.